In this week's Monday Briefing, MEI experts W. Robert Pearson, Gerald Feierstein, Yousef Munayyer, and Alex Vatanka provide analysis on recent and upcoming events including the simmering diplomatic feud between Turkey and the Netherlands, the Chinese offer to act as a mediator between Iran and Saudi Arabia, the congressional debate whether to supply aid to the Palestinian Authority, and the growing French business footprint in Iran. First with Germany and now with the Netherlands, Turkey’s unprecedented verbal attacks are damaging key Turkish interests. Apparently determined at any cost to win the April 16 referendum to give President Recep Tayyip Erdogan virtually unlimited power, Turkey’s governing party may be on the way to destroying its credibility in Europe. While responsible Europeans may not explicitly say so, Turkey acts as if it is bidding farewell to any hope of entering the E.U. in any imaginable future, sinking a golden opportunity to reach a deal on Cyprus, and weakening the most successful security alliance in modern history: NATO. 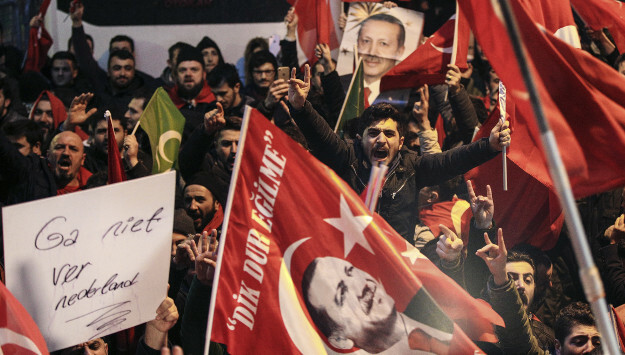 Political leaders in Europe are concerned that the appearance of Turkish ministers at large public rallies in the Netherlands and Germany could incite violence and feed the dangerous growth of right-wing parties in Europe. Instead of helping lower these risks, Ankara is provoking the E.U. The Customs Union between the E.U. and Turkey has brought to both enormous wealth and direct investment in Turkey. The government’s attacks will likely diminish European investment flow into Turkey. These choices now join the growing difficulties Turkey faces in Syria where neither Russia nor the United States seems persuaded by Turkey’s aims or actions. Ankara always has the option to join with its traditional friends—the United States and Europe—to build a better future domestically and abroad. Turkey’s present course could be leaving in its wake a growing number of events that make longer term stability and prosperity more elusive. As the leading customer for Saudi Arabia’s oil exports, China is a mandatory stop on King Salman’s Asia-Pacific tour billed largely as a trade mission. The visit to Beijing provides opportunities not only to tout Saudi opportunities for Chinese investment, but also to boost the military and security relationship between the two countries. As China plans to increase its military presence in the Gulf through the Pakistani port of Gwadar and in the Red Sea as it develops its naval presence in Djibouti, the logic for Saudi-Chinese coordination on security matters will strengthen. Successful reduction of Saudi-Iranian tensions remains a long shot. But the Chinese may calculate that the effort alone will enhance their credibility as a major regional player. Moreover, even a minor reduction in Gulf tensions will complicate Trump administration efforts to increase pressure on Iran, thereby avoiding a major political dilemma for China in its dealings with the United States. Few things are as routine in Washington as the seemingly perennial congressional debate over U.S. funding to the Palestinian Authority. For years, America’s complicated relationship with the P.A. has featured in bout after bout between hawkish members of Congress, often hoping to burnish their pro-Israel bona fides. While there have been fits and starts, more often than not transfers are ultimately made. This happens not out of any particular fondness between the United States and the P.A., but rather because the P.A. serves an important purpose for Israel as a security subcontractor in heavily populated areas of occupied territory. If the P.A. was not providing this service, Israel would have to do it alone. Aid to the P.A. is thus another form of aid to Israel. This has not stopped the Israelis from finding additional ways to leverage this aid to the P.A., including through supporting, on the one hand, consistent congressional threats to cut or condition such aid, while on the other hand communicating privately to policymakers that aid to the P.A. is an Israeli interest. This dual-game keeps the Palestinian Authority in a position where it constantly has to prove its worth by highlighting its security collaboration with Israel to Washington. But this comes at a price as well since the Palestinian public views this collaboration negatively and often as treasonous. This tension has been on display particularly in recent days after Israeli forces, presumably with P.A. collaboration, killed a well-known Palestinian activist in a West Bank refugee camp. Palestinians protesting his killing were put down by the repressive agents of the Palestinian Authority. This past week, Airbus delivered its second new aircraft to Iran as part of a multi-billion dollar contract for 100 aircrafts. The 2016 Airbus contract is hailed as a win-win for both the French and the Iranians, with an Iranian delegation visiting France this week for talks with Airbus. The deal will help Iran replenish an aged aircraft fleet while Airbus and the French tap into a market of 80-million people hungry for many Western goods and services. Officials in Tehran say four million Iranians use foreign airlines every year due to the bad condition of Iran’s air fleet. In the 2011-14 period, Iranians spent $12 billion on flying non-Iranian airlines. Meanwhile, the French are keen to build on the Airbus contract. Data shows that France is Iran’s third biggest E.U. trading partner totaling $2.2 billion in 2016, representing a 235 percent increase compared to 2015. In order to facilitate stronger trade ties, France issued 40,000 visas to Iranians in 2016, a figure that is to be doubled by 2017. From oil and gas to aviation, auto and cosmetic industries, the French business footprint in Iran is on the rise. One big obstacle, however, is ongoing financial restrictions that impact Tehran’s ability to operate in international markets. Of the 40 E.U. banks that operate in Iran, only two are French. Such banks are mostly small-to-medium size. They adhere to E.U. regulations, but major international banks are still wary of working in Iran due to uncertainty about possible American objections. However, while limited banking represents a bottleneck, the French might look to others to find a pathway to finance big projects in Iran. The South Koreans, for example, just signed a $3.2 billion petrochemical deal in Iran and 95 percent of the funding is said to have come from South Korean financial institutions.